Keeping your team connected requires uninterrupted radio coverage. Using the MOTOTRBO™ SLR 1000 repeater, you can easily extend the range of your network through dead zones and across remote locations, so everyone’s within reach. Deploy the SLR 1000 indoors or out—it’s IP65-rated for dust and water protection. 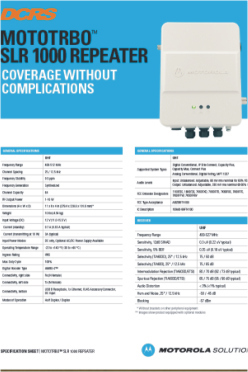 The small form offers users the ability to mount the repeater in standard and more unusual areas such as on walls or outside on pole mounting brackets. The repeater is a low power, low noise, fan-less design and supports all MOTOTRBO™ system types with a 10W/5WRF output (un-duplexed/duplexed).